Martin Luther King Jr.’s words came to mind as I watched protesters on Sunday flood the streets of Memphis, Tennessee, the city I call home. The protesters, almost all of them black, shut down a bridge that crosses the Mississippi River. They were prompted by police killings of Alton Sterling and Philando Castile last week, but also spurred by the disinvestment and deep poverty that saturates black Memphis. The police chief came to the scene and called for peace. A protester shouted for justice. After the chief and protesters agreed to meet the next day, the crowd dispersed with no arrests. It was then that city leaders began to brag, as if empty streets, not equality, is success. “No one was injured. It was peaceful. It did not escalate. Memphis set an example for the world,” said Memphis Mayor Jim Strickland at a news conference. Like many before him, he confuses order and deference with true peace, which requires justice. Where other protests against police brutality have erupted, calls for order often came with tear gas. In Memphis, calls for order came with promises of dialogue, which often take the form of delays or denial, but almost always end up maintaining the status quo. And sure enough, by the time of the agreed meeting, the hashtag #BlackLivesMatter had been replaced by #OneMemphis. It feels like a branding trick, a way to leapfrog over the city’s persistent racial inequality and into some tourist-friendly utopia where the disparities are made invisible. In a church sanctuary Monday, hundreds of black Memphians had an audience with the black police chief and the white mayor, who sat on a stage flanked by black pastors and organizers. When people who feel ignored finally get the microphone, don’t be surprised when they won’t give it up. Their complaints stretched beyond policing into education and employment and felon disenfranchisement. Several said they’d contacted the mayor’s office for help, but got no reply. 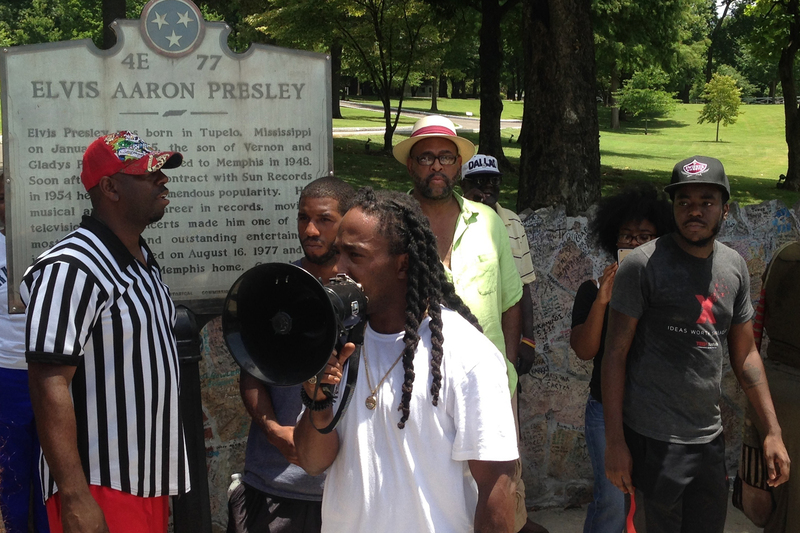 Memphis police say a small group of people associated with the Black Lives Matter movement have gathered outside the late musician Elvis Presley’s home, Graceland, and two people have been detained for blocking the street. Police spokeswoman Karen Rudolph said about 30 protesters are at Graceland. Yet, here too, the insistence was on order — writing your question on an index card, standing in line, waiting your turn to speak, expressing your anger in a way that doesn’t sound, well, angry. A young black organizer played the part of the police, warning the crowd not to act like “wild animals,” as if the officials there were company and not public servants. Dozens of young black men stood in front of the newly elected mayor, pleading for jobs, a path to move past their criminal records and, yes, an end to police harassment. They all but begged to have their humanity acknowledged. Their desperation echoed the black sanitation workers’ strike in 1968, and signs that testified to what should have been self-evident: I am a man. This, too, is the example Memphis sets. It is a city that has neglected to realize King’s vision for economic justice. This is Memphis, where more than 50 percent of the city’s black children live in poverty. Here, African-American homeownership rates are lower, our life expectancy rates shorter and our neighborhoods’ food deserts are wider. The city’s only black-owned bank is now controlled by a bank that will pay nearly $2 million to settle claims it refused to lend to black and brown homebuyers. Four years after the feds forced reforms at juvenile court, investigators report that the court still discriminates against black children. This is Memphis. Across the Mississippi River, at a memorial service Tuesday for the five white Dallas police officers killed last week by a black gunman, President Barack Obama struck a hopeful note about the racial tension that stands in the way of peace. “I’m here to insist that we are not so divided as we seem,” he said. To protesters who don’t need reassurances but equality, those words are little comfort. As Obama spoke, dozens of protesters in Memphis returned to a means they now know will garner attention and an audience otherwise denied. They blocked traffic on Elvis Presley Boulevard, right in front of the late musician’s home, Graceland. They chanted, “No justice, no peace.” And several were arrested, willing to create the necessary tension to force justice. This is the example that Memphis now sets.